Tony Abbott says Australia should take advantage of Britain’s decision to leave the European Union by striking the simplest trade deal possible with the country, and quickly. He says the deal should come into force on the day Britain formally leaves the European Union, and it shouldn’t wait until a broader European agreement is struck, according to the Australian. The former prime minister says Australians and Britons should be allowed to more freely work and travel in each other’s country – given their shared history and culture – and Australians should stop facing passport queues at Heathrow airport. Abbott says the new trade deal should have no carve-outs or tariffs or quotas, and should allow workers and goods to be seamlessly transferred between countries. He will reveal his plan at a UK-Australia Chamber of Commerce breakfast on Monday. 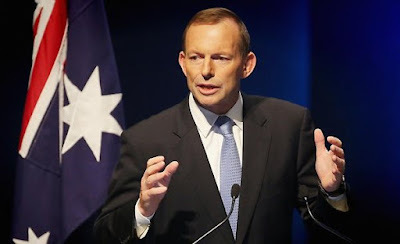 “There should be no tariffs or quotas whatsoever on any goods traded between our two countries – there should be no exceptions, no carve-outs, nothing,” Abbott will say. He will also criticise the European attempt to harmonise standards and regulations across Europe, saying the process is too cumbersome and complicated. He says Australia and Britain should instead base their trade agreement on “mutual recognition” of each other’s industry standards because that would be simpler and more effective. “[It should be] an entirely seamless economic relationship based on free entry of goods, ­mutual recognition of services and standards, and easy entry of qualified people,” he will say. Abbott will also tell the audience he likes what he has seen in the aftermath of Britain’s decision to leave the EU. “Post-Brexit, the stockmarket’s up, employment’s up and economic growth is up, the pound’s down, but that should more than compensate for any tariffs that the EU is foolish enough to impose,” he will say. He will characterise the decision as a sign the British people have taken back their country and now British courts will no longer be subject to directives from European courts. He says a new Australia-Britain free trade deal could become a template for future British deals with New Zealand and Singapore. In June, immediately after Britain voted to leave the EU, Martin Schulz, the president of the European parliament, said the bloc wanted Britain out as soon as possible. It would also have to negotiate a deal with Australia.